the all natural mist for dry eyes. 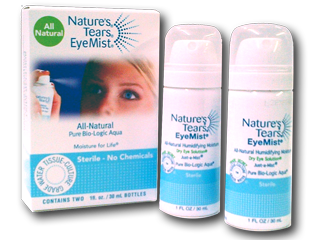 Apply Nature's Tears® EyeMist® as many times a day as needed - even while wearing contact lenses. Nature's Tears® EyeMist® is a gentle, all-natural mist that slows tear film surface evaporation that can lead to ocular dehydration or "dry eye." Nature's Tears® EyeMist® soothes eye discomfort, burning and blurred vision associated with dry eye, eye allergies, watery eyes, red eye, eye fatigue and many other causes of eye irritation.